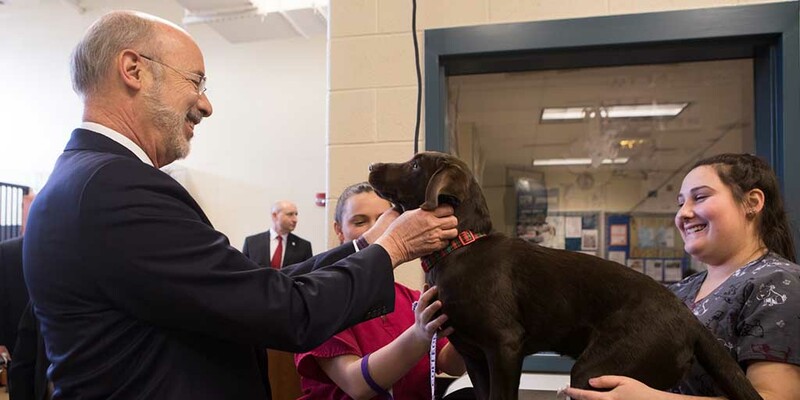 Harrisburg, PA – Governor Tom Wolf announced today that Pennsylvania demonstrated marked improvements in two national organizations’ recently issued reports ranking all 50 states’ animal protection laws. Both the Humane Society of the United States and the Animal Legal Defense Fund report that Pennsylvania’s Act 10 of 2017, the animal abuse overhaul package that Governor Tom Wolf signed into law in June 2017, was a key reason why Pennsylvania’s rankings improved. According to the Animal Legal Defense Fund report, “Best And Worst States For Animal Protection Laws,” Pennsylvania was the most improved state in 2017, jumping 20 places to number 24 on the list ranking the animal protection laws of all 50 states. For the tenth year in a row, Illinois ranked first, followed by Oregon, California, Maine, and Rhode Island. Pennsylvania’s position moved up from number 18 to 15 on the Humane Society of the United States’ Humane State Rankings.